The Kings Highway Neighborhood Association flooded the Town Plan and Zoning Commission on Tuesday with photos, documents and data to underscore its opposition to a 33-unit apartment building proposed for back-to-back lots on Berwick and Fairchild avenues. Ten of the apartments would be rented in compliance with "affordable" income guidelines. The hearing was the third TPZ hearing on the Berwick Fairchild and Associates application, and the hearing will continue for a final night next Tuesday in order to give the applicant and commission time to review the material submitted by opponents. 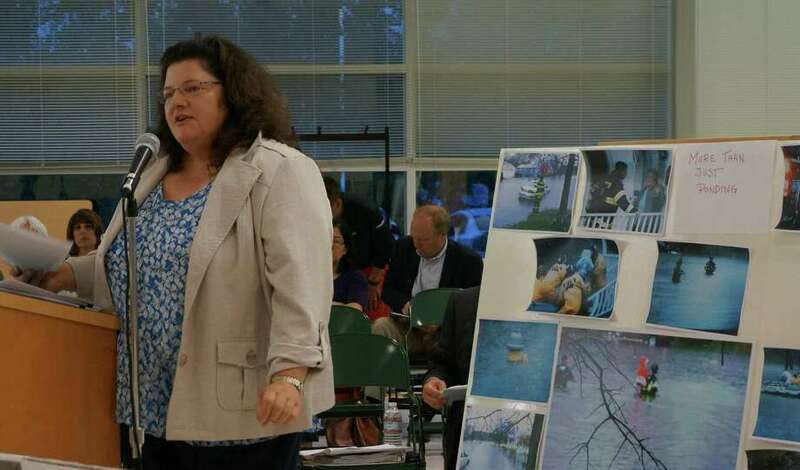 Kathy Braun, the lawyer hired by the neighbors, pointed out that the only flood-related death in town in recent history happened in the neighborhood where the apartments are proposed in 2006, when 6 inches of rain sent the Rooster River spilling over its banks. The victim, a 71-year-old woman, was clearing debris from her backyard, thinking the danger had passed, when she drowned. The flood danger was a point hammered home by residents, who had pictures of flooded area streets and yards, and firefighters carrying children to safety. "We watch the sewer at the end of our driveway," said Albert Strauss, who lives at 144 Berwick Ave., "and if it starts to bubble up, we have to move our cars." Flash floods from the Rooster River are not uncommon, he said, and "the water can rise very quickly. Federal Emergency Management Agency maps classify the neighborhood as an AE flood zone, meaning it is at a high risk for flooding. Plans by the state to improve conditions and remove the choke points in the river to alleviate flooding were approved in 2007, along with $17 million in bonding to cover the costs. However, the bonding was rescinded the next year. Amy Mezoff, of Robin Lane, asked if the 10 units of affordable housing in the building would be worth "putting the residents of the neighborhood and their children, the tenants of Garden Homes and Berwick Fairchild, the safety of our officers and EMTs at more risk for reduced rent housing that also puts them in harms way?" A new 55-unit affordable housing complex, Garden Homes, is near completion at the end of Fairchild Avenue, across from the proposed Berwick Fairchild complex. Mezoff and others also said 33 more housing units in the neighborhood will only exacerbate problems with traffic and parking. Mezoff pointed out that Save the Children is opening its headquarters about a block away, Walgreen's is going up across Kings Highway and a Lexus service center is also opening nearby. "I think it is safe to assume that anything that increases traffic volume will have a negative effect," she said. The neighbors said there already is a lack of street parking, with very few spaces, if any, available for overflow parking from tenants of the proposed building.